Looking for fun activities to celebrate St. Patrick’s Day for Kids? 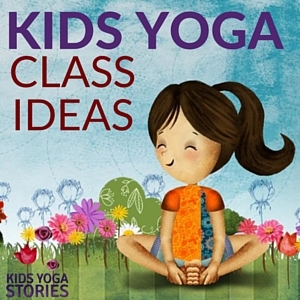 Why not read some children’s books and act out this world-renowned Irish holiday through yoga exercises for kids! See below for a list of our five favorite St. Patrick’s Day books that we found in our local library. 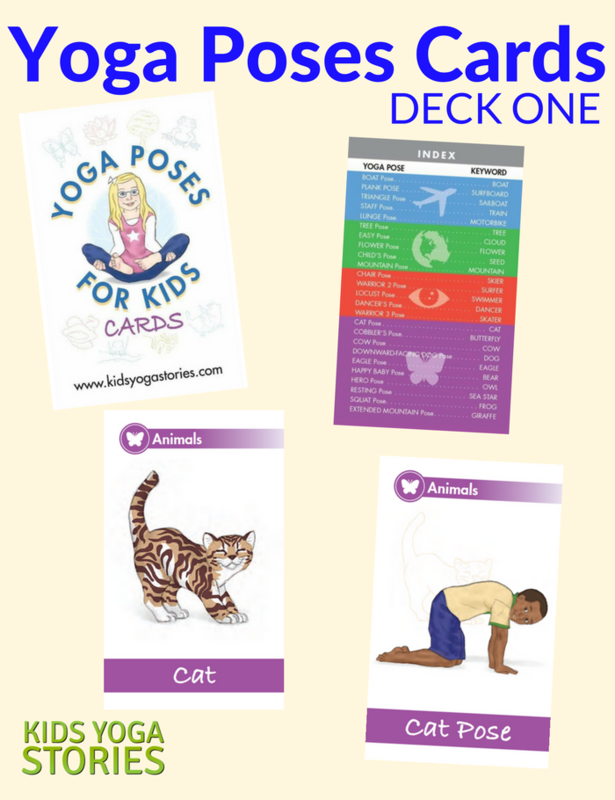 You can also follow along the five yoga poses that were taken from our St. Patrick’s Day Yoga Cards for Kids downloadable card deck. 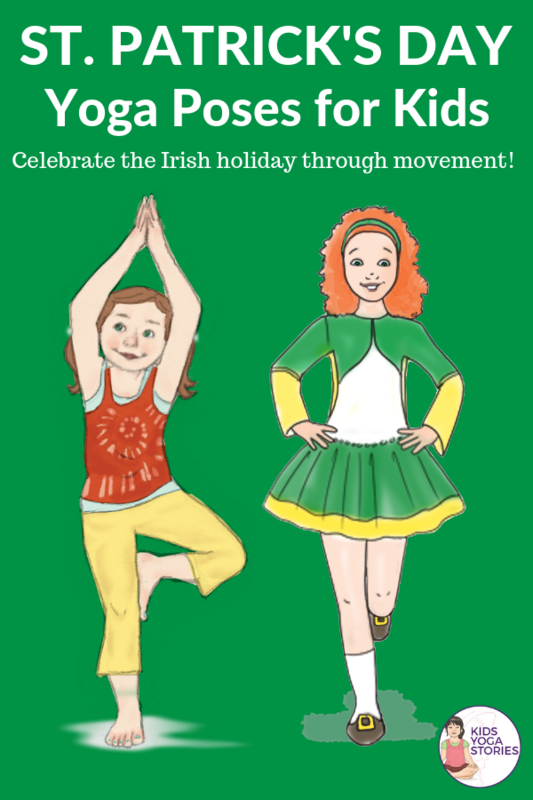 Or make up your own Ireland-inspired yoga moves. 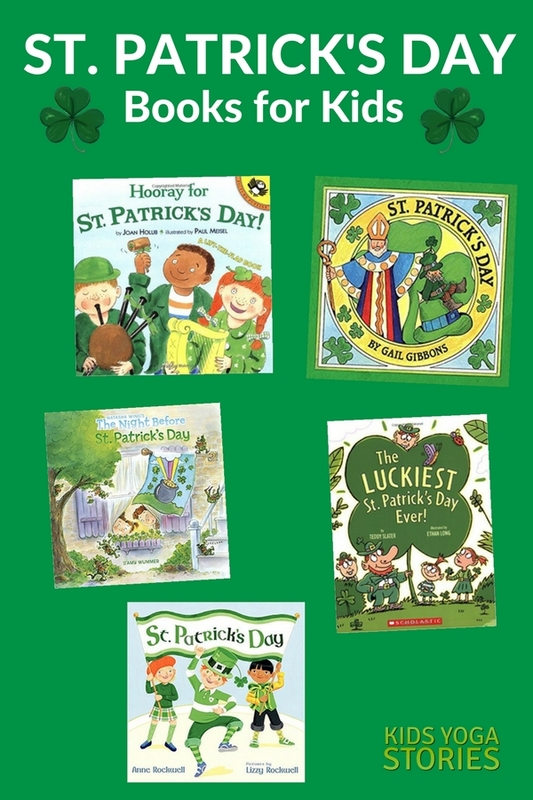 This lift-the-flap book with cute illustrations and simple text is a perfect introduction to St. Patrick’s Day for young readers. This author does an excellent job of introducing holidays throughout the year in an engaging way through non-fiction books. This one details the history of St. Patrick’s Day. This popular rhyming book is part of a long list of “T’was the Night Before” series by this author. Bright illustrations and engaging text make this a good one. This upbeat rhyming book follows the characters in the parade, home for a feast, and then singing and dancing. This was our favorite St. Patrick’s Day book. This mother-daughter team does a fabulous job of teaching about holidays through realistic illustrations and real-life stories. This story shows how St. Patrick’s Day is celebrated in the classroom. The St. Patrick’s Day-themed yoga poses in the following list are sequenced specifically to invite flow from one pose to the next. Focus on having fun with movement, not on practicing perfectly aligned poses. Feel free to add your own Irish-themed songs, music, relaxation stories, or props. Make the St. Patrick’s Day yoga experience your own. 1. I am Saint Patrick. Practice Mountain Pose: Stand tall with your legs hip-width apart and feet facing forward. Take your arms straight alongside your body. Pretend to be Saint Patrick casting the snakes from Ireland. 2. I am dancing the jig. 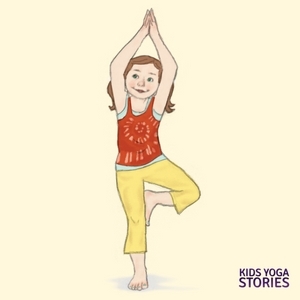 Practice Tree Pose: Stand on one leg. 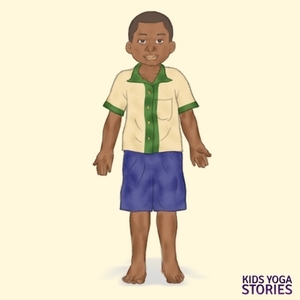 Bend the knee of the leg you are not standing on, place the sole of your foot on the opposite inner thigh or calf, and balance. Pretend to be dancing the jig. Switch sides and repeat the steps. 3. I am a leprechaun. 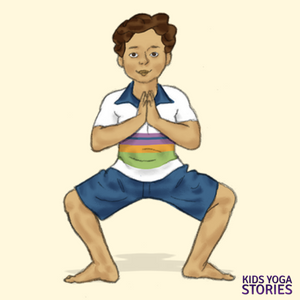 Practice Horse Stance: Stand with your legs apart, feet facing slightly outward. Bend your knees and stand firm. Pretend to be a leprechaun guarding his gold. 4. I am a shamrock. 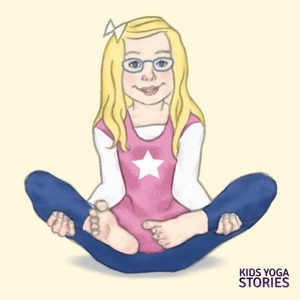 Practice Flower Pose: Come to sit on your buttocks with a tall spine, lift your bent legs, balance on your sitting bones, and weave your arms under your legs with your palms facing up. Pretend to be a shamrock bringing good luck. 5. I am a pot of gold. Practice Happy Baby Pose: Lie on your back with your chin tucked in, hug your knees into your chest, then grab the outer parts of each foot—right foot in right hand and left foot in left hand. Pretend to be a pot of gold at the end of a rainbow. 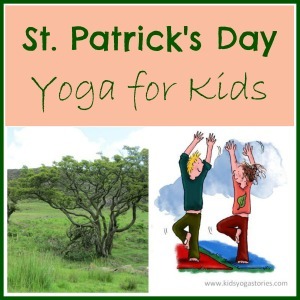 Celebrate St. Patrick’s Day through yoga moves for kids! Pretend to be a sheep, shillelagh, and shamrock! 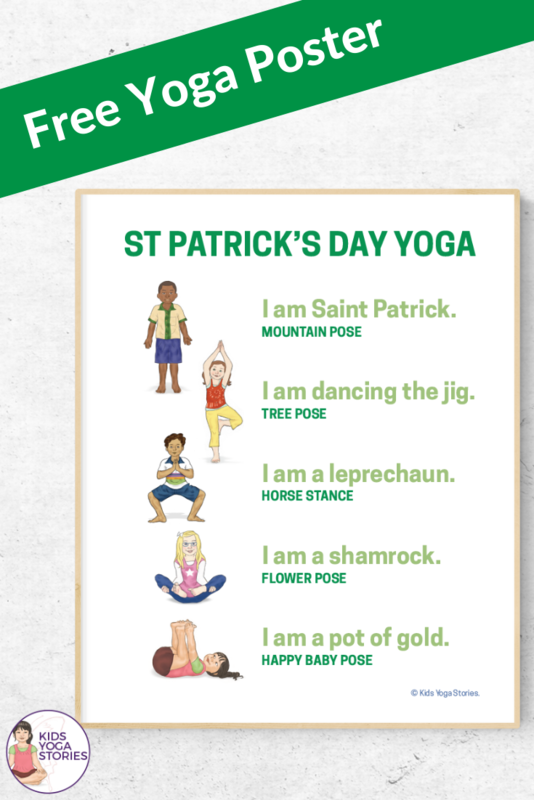 Instantly download these 53 St. Patrick’s Day digital yoga cards to celebrate this Irish holiday in your home, classroom, or studio. 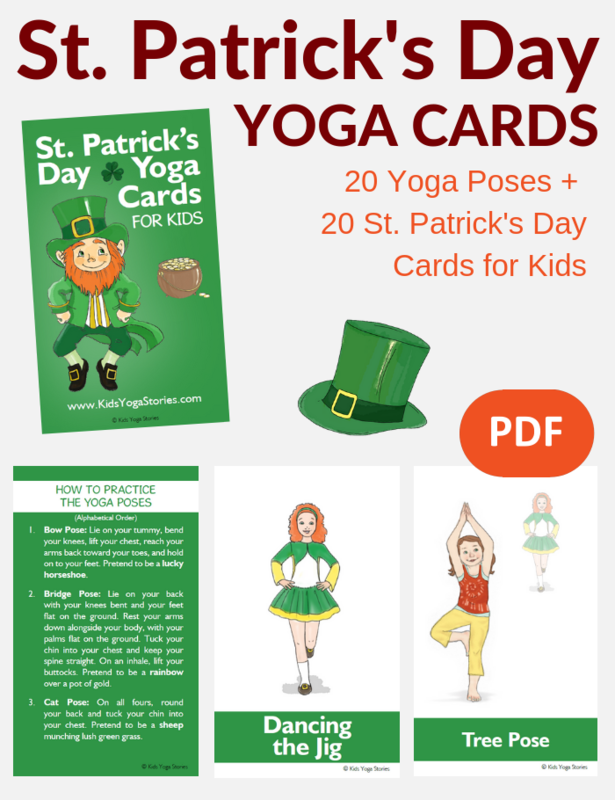 Includes an Index Card, Yoga Tips, Pose Instructions, 20 Yoga Pose Cards, and 20 matching St. Patrick’s Day Cards. 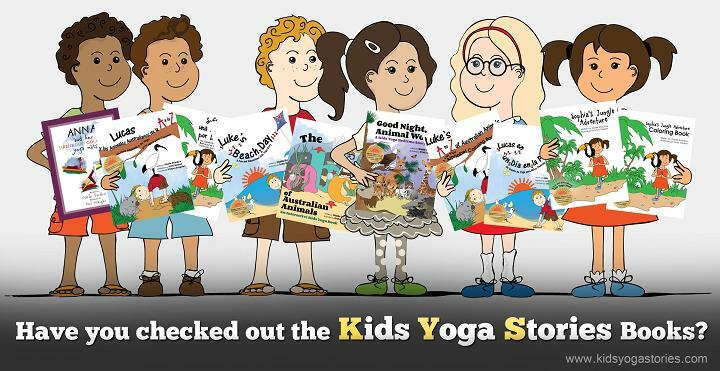 The multicultural yoga kids are from seven countries. Ages 3+. 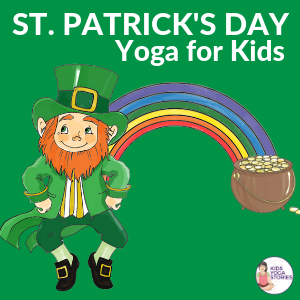 Purchase your St. Patrick’s Day Yoga Cards for Kids.